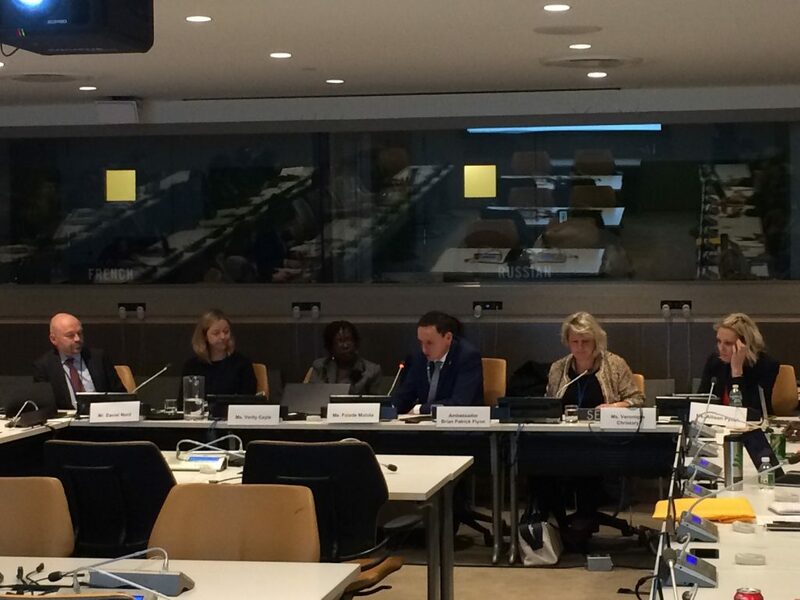 On 19 October 2018, a side event entitled “How to Use the Arms Trade Treaty to Address Gender-Based Violence” took place during the United Nations First Committee, offering an introduction to a recently published risk assessment guide of the same name. The Permanent Missions of Ireland and Sweden to the United Nations co-sponsored the discussion, which included participants from Control Arms, the International Committee of the Red Cross (ICRC), Reaching Critical Will and the Women’s Institute for Alternative Development. The official added that Ireland gives high regard to the risk assessment guide, as the document directly complements a 2017 Irish working paper on how best to implement the GBV provision of the ATT. “How to Use the Arms Treaty to Address Gender-Based Violence: A Practical Guide for Risk Assessment” was published by Control Arms in August 2018 to provide licensing officials with a framework for considering GBV in arms export assessments. This report, comprising contributions from civil society and international organizations, notes that the ATT explicitly requires exporting States parties to consider GBV in such assessments. Mr. Daniel Nord, Senior Disarmament Advisor to the Permanent Mission of Sweden, explained that Sweden places a high priority on women, peace and security, and he stressed the significance of the ATT implementation in this context. He reminded panel participants that Sweden has an arms industry, but he also noted that arms exports make up only 1 per cent of its gross domestic product and small arms and light weapons are not the focus of production. Mr. Nord, who facilitates the ATT sub-working group on Articles 6 and 7, admitted that more work on GBV is needed. He said Sweden took one step in this regard when it organized a workshop with government agencies and civil society to address the effects of export control on GBV. Ms. Folade Mutota, Executive Director of the Women’s Institute for Alternative Development based in Trinidad and Tobago, expressed the desire to tackle GBV using the ATT. She said the ATT requires an “unyielding commitment” from all stakeholders to protect women and girls from GBV, in particular its socio-economic and cultural impact. Beyond the ATT framework, Ms. Mutota further noted that the illicit proliferation and the misuse of small arms contributes to GBV and to unequal power relations between women and men. Victims and survivors of GBV must be given care and support that protects them from revictimization, she said, adding that effective implementation of the Secretary-General’s Agenda for Disarmament can help protect women and girls. Ms. Veronique Ginette Christory, Adviser to the ICRC, referred to the tragic murder of a colleague in Nigeria, in March 2018 that coincided with the abduction of another ICRC worker who remains missing. Both were women and mothers. GBV does not happen in a vacuum and having strict criteria on paper will not be enough to prevent such violence, Ms. Christory stressed. She called for ongoing efforts to ensure that States Parties effectively implement export controls and actively acknowledge the role of the arms trade in contributing to GBV.